MIAMI, Florida -- National Hurricane Center storm tracker in Miami, Florida has issued a Tropical Weather Outlook at 8 p.m. EDT on August 7, 2016 which predicts a low (20%) chance of an area of disturbed weather becoming a tropical cyclone off the coast of Florida during the next five days. 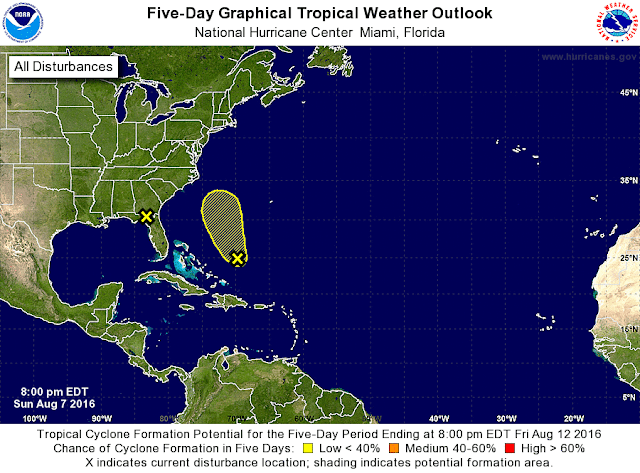 The area of disturbed weather is located a few hundred miles east of the central Bahamas. Although the associated showers and thunderstorms have been persistent, there are no signs of a surface circulation. NHC forecasters say that development, if any, of this disturbance is expected to be slow to occur while it moves generally northward off of the coast of the southeastern United States. There is another area of concern that NHC forecasters are keeping an eye on. A weak area of low pressure located inland over the northern Florida peninsula continues to produce showers and thunderstorms, primarily over the Gulf of Mexico and the Florida panhandle. This system is expected to move slowly northward during the next couple of days, taking the low pressure system farther inland. Although tropical cyclone formation is not expected, heavy rainfall that could result in flooding is likely over portions of the northern Florida peninsula and the Florida panhandle during the next few days.